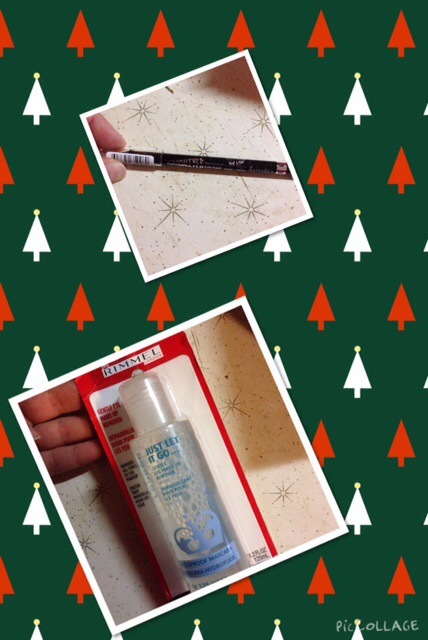 I received a Rimmel Scandaleyes eyeliner and their Just Let It Go… gentle eye makeup remover free from Influenster for testing purposes. The eyeliner is seriously the BOMB! It goes on so smooth, no tugging whatsoever. The color is so saturated, a really true black. It made it so easy to do a winged line. The makeup remover is so gentle, it actually made the skin around my eyes feel better. It’s really soothing, not drying at all! Also, it removed everything. Not a speck of my eye makeup was left. Rimmel has two more winners in their awesome line of products! 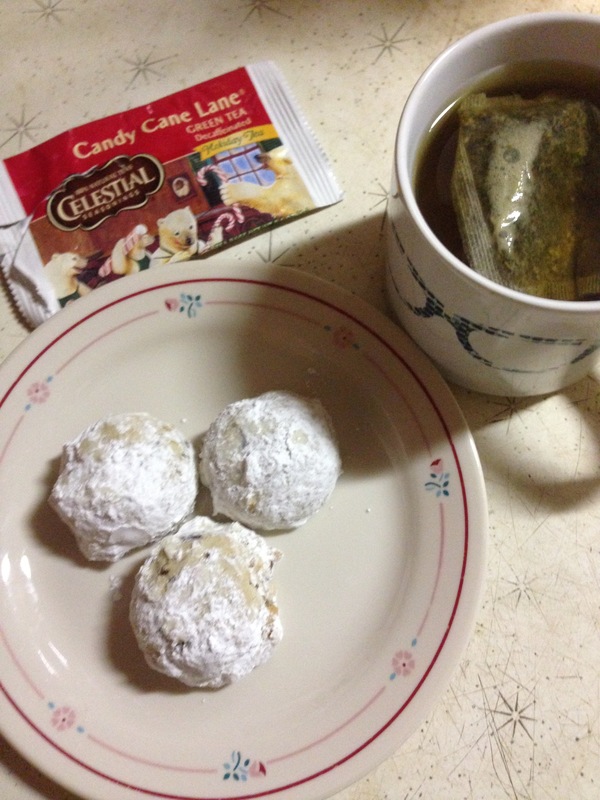 I recently tested Celestial Seasonings Candy Cane Lane Decaf Tea. Honestly, I didn’t think I would like it. When it comes to tea I’m a purist. I stick to Oolong or English Breakfast, plain or with a little bit of honey. Definitely nothing flavored. So I was a little skeptical about trying it. I was pleasantly surprised, it has a smooth flavor, not too minty. I feel like this would be something to have on hand if you’re getting a cold or a sore throat. It’s really comforting. If I were you I would stock up, I’m sure they’ll be scarce after the holidays. I received this complimentary from Influenster for testing purposes. 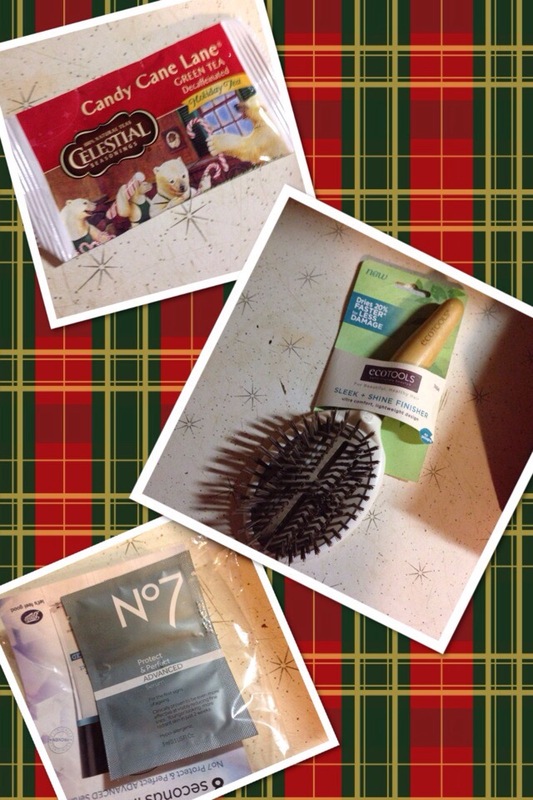 Thanks to Influenster, I received another wonderful Vox Box full of scrumptious goodies. Some edible, some not. They gave these to me free for testing purposes. Included in this box is a full size bottle of Rimmel Gentle Eye Makeup Remover and their Scandaleyes Kohl Kajal eyeliner. 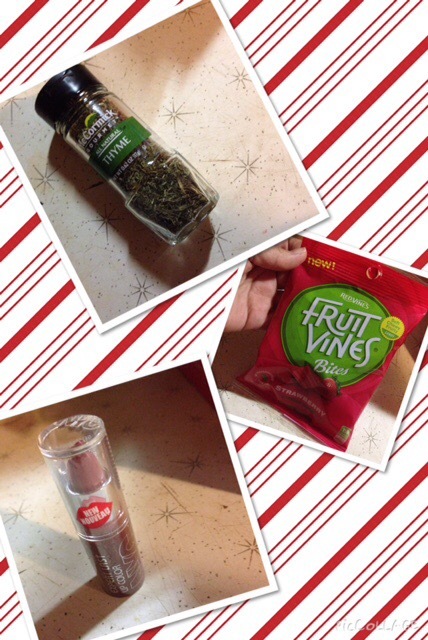 McCormick Gourmet Thyme. I’m cooking my first prime rib roast on Christmas Eve and thyme is going on it. It is the perfect holiday flavor. 9 times out of ten when you taste something that reminds you of the holidays, it has thyme in it. Red Vines Fruit Vines, I prefer Red Vines to the other big licorice candy company. They taste too waxy and don’t have much flavor. These are the bomb! Red Vines and I have watched many a movie together. These are little bite size candies and the flavor just bursts in your mouth. New York Color lipstick in Sugarplum. I loved this color before I even put it on and with a name like Sugarplum it’s perfect for the holidays. Celestial Seasonings Candy Cane Lane Decaf Tea, I can’t wait to cozy up under my tree with a soft blanket and a hot cup of this tea! EcoTools Sleek and Style Finisher hairbrush. I love Ecotools products and I’m sure this will go onto the A-list. Boots No7 Protect and Perfect Advanced Serum. I’ve never used and of their products but I’ve heard a lot of good reviews, so I’m excited to try this. 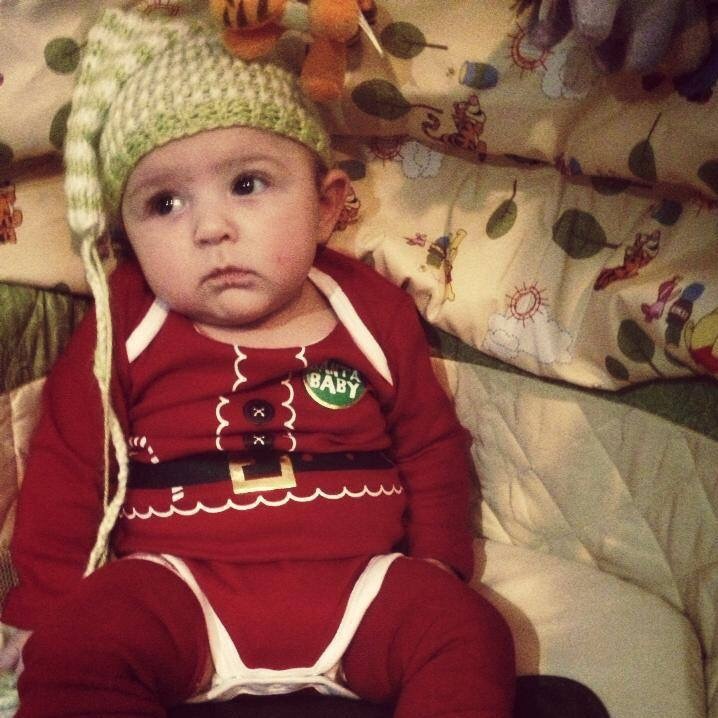 When I had my son, Mason in 2012, I envisioned our first Christmas to be like those you see in a magazine or an Anne Geddes calendar. Guess what, it was far from it. Not from a lack of trying on my part. I bought him the cutest little onesie that said “Santa Baby” and paired it with some Santa Babylegs leg warmers and a little elf-esque hat that a friend of Troys made him. He was adorable! My heart soared thinking of the cute pictures I was going to get on my DIY photo shoot. I’m notorious for setting myself up for disappointment. This day was no exception. Mason was adorable, we’ll just because he’s a good looking kid. The photos in my head did not translate into real life. This is all the face I could get. I love it, he’s cute but I had this idea of those cute toothless grins I’ve seen numerous times on Instagram. You can see it on his face, he was completely annoyed with me, the outfit, the camera. He was having no part in this hoopla I was trying to create. So I figured I would get myself one of those Norman Rockwell like Christmas trees. Now I live in an area that is overrun with trees. Most of them pine. However, we have no local tree lots, and most of the land with the trees is privately owned. Walmart does sell trees, but they’re $40, small, and not local. Instead I became the proud owner of a 7 1/2 foot fake tree. It’s actually quite nice and looked beautiful after I decorated it. Next in my quest for the most perfect first Christmas, was the cookies, and gingerbread house. Now remember, my so was only three months old. None of this was for him, it was for me. This part I wasn’t too worried about, I’m confident in my baking abilities. It did go smoothly, until I was just finishing up making little black hats out of sparkly black piping gel for the snowman sugar cookies. You know that scene in National Lampoons Christmas Vacation where they hear the squeaky sound in the tree. That was me, except it wasn’t a squeak, it was a cracking noise. I looked up just in time to watch, in horror, as my tree with ornaments I had been collecting since I was a small kid, came crashing to the floor. I Kim Kardashian ugly cried for at least an hour. It was Christmas Eve, my tree was laying in a pile of glass and tinsel. Even the star on the top was shattered. After everything was cleaned up, I got myself and Mason dressed, took his Christmas gift and went to my parents house to partake in our holiday traditions. I got there in a bad mood, frustrated at my failed attempts at the perfect Christmas. After all of this I came to a conclusion, all of those Instagram pics are photoshopped, and the moms are liars. Their kids aren’t all sitting there smiling in their matching pajamas. They aren’t gathered around a perfectly decorated tree with evenly spaced lights and ornaments. The rooms filled with poinsettias and amaryllis. It’s all green screen and Photoshop. Their perfect Christmas meal, they ordered from Holiday in a Box. The cookies, the local bakery. No one is that perfect. Maybe I’m right, maybe I’m not. As Christmas creeps closer and my gifts are unwrapped, cookies, and Nisu unbaked I take comfort in my theory that they’re just as disorganized as I am. Merry Christmas! Happy Holidays! Whatever it is that you celebrate I hope it’s filled with love and happiness! I’m going to try to take that picture I keep seeing on Pinterest. You know the one with the little kid in the Little Tykes Cozy Coupe with the little Christmas tree tied to the roof. I’m sure Mason will be more cooperative this year, right?